VCSEL stands for vertical cavity surface emitting lasers. There is a current demand for efficient, low-cost, and compact illumination systems, replacing traditional thermal imaging systems. VCSELs are used for infrared illuminations since they offer a host of advantages, including low cost, high reliability, efficiency, narrow emission spectrum, and a low diverging cylindrical beam. Infrared illuminators, in turn, find application in surveillance, imaging, covert operations, and detection in several end-use industries such as the military. This has had a considerable impact on the demand for VCSELs. The global market for VCSELs was valued at US$775.2 mn in 2015 and is expected to reach US$4,728.8 mn by 2024, growing at an impressive CAGR of 22.3% during the forecast period. By raw material, the global VCSELs market is segmented into indium phosphide (InP), gallium arsenide (GaAs), gallium nitride (GaN), and others materials such as InGaAsN and AlGaAs. 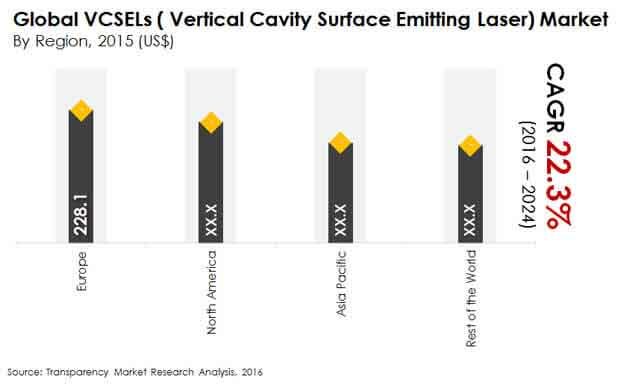 Gallium arsenide (GaAs) wafer-based VCSELs held the dominant share in the market in 2015 due to their compatibility with cavities between 800nm and 900nm. This has enabled the raw material to gain significant demand in the optical communications market. On the basis of application, the global VCSELs market is categorized into chip scale atomic clocks, biological tissue analysis, computer mice, laser printers, absorption spectroscopy, analog broadband signal transmission, optical fiber data transmission, and others. Optical fiber data transmission held the leading share in 2015 and is expected to expand at a steady pace during the forecasted period. This is can be attributed to a growing network bandwidth worldwide. In 2015, Europe dominated the global VCSELs market, primarily due to the recovery of several European economies from the debt-crisis. Countries in the region have been showing signs of recovery and as the euro strengthens, many manufacturers are renewing their production. This has provided the VCSELs market a vital boost. The VCSELs market in North America has grown significantly over the years. The major trend that has supported this growth is heavy investments by the U.S. government in new VCSEL defense developments. Another factor driving the market in North America is the research undertaken by universities in this region to develop more efficient and stable laser diodes. The presence of many global semiconductor companies specializing in laser diodes has also benefited this market. Asia Pacific is estimated to be a significantly attractive market for VCSELs manufacturers mainly because of the large-scale industrialization in this part of the world. Large companies are often inclined to opening subsidiaries or branches in emerging economies such as India in order to take advantage of cheap labor. The rapid growth of industrial automation in Asia is another factor boosting the demand for VCSELs in this region. The increasing demand for computers, LED displays, and communication devices in developing APAC countries is likely to lend a boost to the VCSELs market. Key players in the VCSELs market include IQE Public Limited Company (United Kingdom), Finisar Corporation (United States), Broadcom Limited (Singapore), II-VI Incorporated (United States), Coherent, Inc. (United States), Panasonic Corporation (Japan), Newport Corporation (United States), Royal Philips Electronics N.V (Netherlands), Princeton Optronics Inc (United States), and Lumentum Holdings, Inc. (United States). Vertical Cavity Surface Emitting Lasers (VCSEL) are semiconductor lasers, or more precisely laser diodes with monolithic laser resonator, where the light emitted leaves the device in a perpendicular direction to the chip surface. This is in contrast to the conventional edge-emitting lasers where the beam is emitted by splitting the single chip out of the wafer. VCSELs have a number of advantages over its conventional counterparts. These include high compatibility with other circuitry and detectors, high reliability, scalability, package ability, and consumption of low power. Moreover, manufacturers prefer VCSELs because it can be tested at a number stages throughout the production process to check for processing issues and material quality. This is a key advantage of VCSELs over edge-emitting lasers and helps in lowering significant production cost. The above mentioned advantages increase the demand for VCSELs and boost the global VCSELs market.